Amazon.com description: Product Description: This book constitutes the thoroughly refereed post-proceedings of the 6th International Workshop on Open Hypermedia Systems, OHS-6, and the 2nd International Workshop on Structural Computing, SC-2, held at the 11th ACM Conference on Hypertext and Hypermedia in San Antonio, Texas, USA in May/June 2000. The 19 revised full papers presented were carefully reviewed and selected for inclusion in the book. All current issues on open hypertext systems and structural computing are addressed. 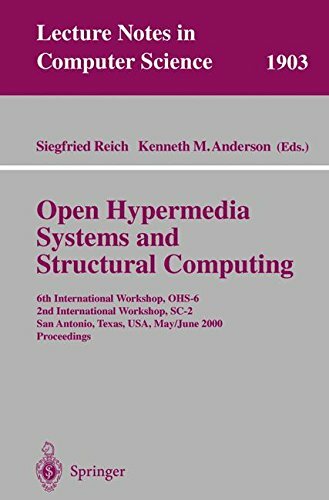 About: This book constitutes the thoroughly refereed post-proceedings of the 6th International Workshop on Open Hypermedia Systems, OHS-6, and the 2nd International Workshop on Structural Computing, SC-2, held at the 11th ACM Conference on Hypertext and Hypermedia in San Antonio, Texas, USA in May/June 2000.